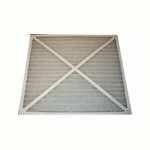 New Deluxe Hunter Air Cleaner Filter, with Carbonite (2 pack) , selling for $21.50 brand new. Manufactured by FiltersAmerica. There are 1 units left brand new.